We take meticulous care of this condo and furnish it as we would our own home, as we like to stay here at times ourselves. Our unit is a completely and beautifully renovated 2 bdrm condo in quiet complex- Pergo floors, granite countennr tops, newly painted sky blue, new tile bathroom floor. It is full of light, and is peaceful and comfortable. You can walk across the street to Carpinteria Beach, one of the loveliest, cleanest beaches at the South Central Coast. We have a year round heated swimming pool at complex, beautiful landscaping, gas grill, and the complex is meticulously maintained. The wildlife refuge is a short walk and has excellent birding. The seal rookery is down the beach. Dolphins and whales swim offshore. Carpinteria is a lovely beachside town with good restaurants, shops, parks, artists' shops, antique stores, and palm tree lined streets. Santa Barbara is 15 minutes up Rt. 101, with many family activities and attractions: shops; zoo; botanical gardens; bike paths; watersports, art museum, natural history museum . Summerland is a great nearby town for antiquing and many wineries are nearby. We live in Santa Barbara, and love the beautiful climate and outdoors we are fortunate to enjoy. We moved here from the Boston area, so it's especially nice in the winter. We have 3 boys, a youngest daughter, and all of us love coming to Carpinteria and going to the beach when we get down to our condo! We loved the town of Carpinteria at first sight. It has a small town, community feeling, and reminded us a little of New England. We enjoy the tall palms lining the streets, expansive beaches, local shops of all kinds, warm breezes, and relaxed and friendly people. We live up in 101 in Santa Barbara but come to Carpinteria regularly because we enjoy it. There are many places to explore: wetland preserve, seal rookery, enormous greenhouses (see the orchids). The foothills are also fun to explore. 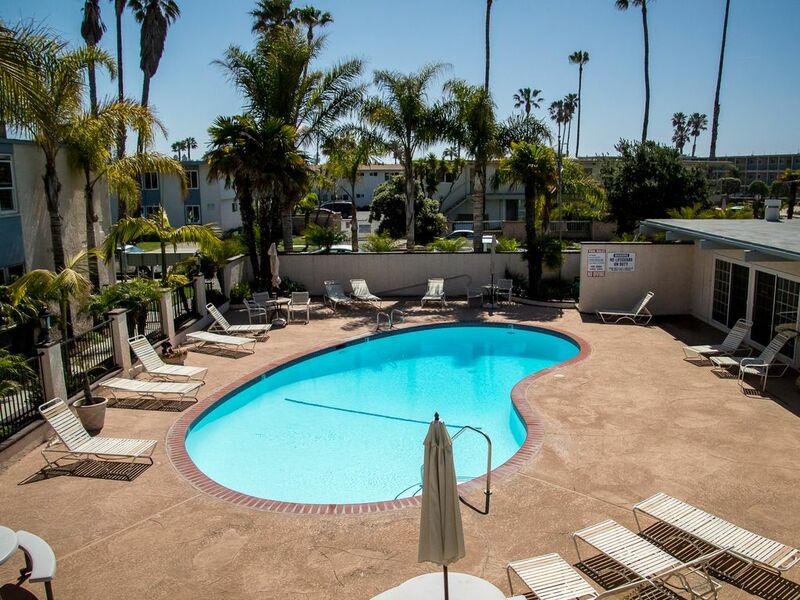 Our condo is in a small complex, La Cabana, across the street from Carpinteria Beach. Most of the condos are owner occupied, so it does not feel like the usual vacation resort. We overlook the courtyard from our second floor unit. We can go out the door in the morning, and walk on the beach in the early light or go for a swim. A short walk away is the Spot, a great local hamburger place, and in the other direction is the wetland marsh preserve. From our unit you can hear the ocean and feel the onshore breeze. Shower / bathtub combo - extra clean and sunny bathroom. Main Street - Downtown Carpinteria is one block away. A Farmer's Market, lovely park, shopping, and more. The beach is just down the stairs and to the right of our front door. Just a few steps away. Mountain views from bedrooms and kitchen. We are on the other side of the street from the ocean. Bath towels, beach towels, dish towels. Bedding and extra blankets. Parking pass is included and the parking is steps from the condo door. We have high speed internet. Yes, lots of beach towels and bath towels. Large and comfortable living room with flat screen TV, DVD player, couch and chairs. Quite comfortable. We have a new, and very quiet dishwasher. There is a full size refrigerator/freezer with ice trays. Full oven and stove top available. Salt & pepper, coffee filters, tinfoil, storage containers - most of the common items needed to cook a nice meal. Yes, all dishes and utensils provided. The kitchen is equip with all amenities such as, a full stove/oven, microwave, Blender, Toaster, Coffee Machine. There are dishes, wine glasses, margarita glasses, pots & and baking pans. There is a small table in the kitchen that seats two - three people. There is also a bar area with two bar stools. No formal dining room. Large flat screen TV in two rooms. Cable TV with many channels. We have a small collection of entertaining books to read. We have beach toys for kids. The complex has a wonderful lawn area. Ocean outside front door, and kayak, bike, surf board - rental store is nearby. There are boogie boards in the condo for guests to use. We are on the second story, and unfortunately there is no elevator. YEAR ROUND heated pool at 84 degrees!!!! The condo is professionally cleaned before you arrive, and after you depart. We have an excellent babysitter you can hire during your stay, and can provide you with tips on fun things to do during your vacation. There are extensive bike trails, wonderful wine tasting tours, spa and massage facilities nearby, annual festivals, art gallery, and much more.